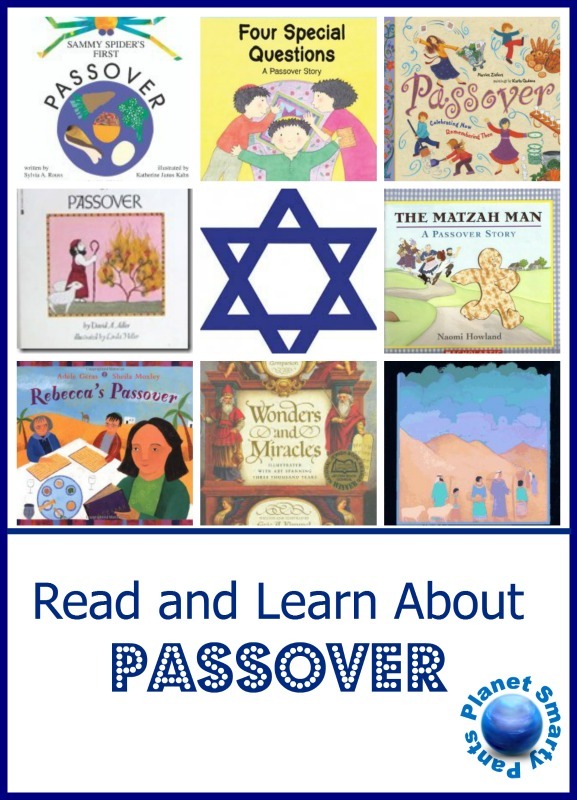 Are you looking to introduce Passover to your children? I am sharing our favorite Passover books for kids starting with books for young preschoolers going all the way up to upper elementary grades. Yesterday the Jews all over the world sat down to the most important meal of Jewish year – the first Seder of Passover. We are not religious, and we chose to postpone Seder to Saturday, since our daughter is still fighting a stomach bug that she picked up somewhere on our cruise. But over years we read many books for kids about Passover, and I want to share them today with my readers. They are arranged from the ones appropriate for the youngest audience to the ones better suited for older readers. Sammy Spider’s First Passover by Sylvia A. Rouss is one of the books in a series about a young spider who lives with his Mom in a house of a Jewish family. This book gives a very basic introduction of Passover to young (think age 3 or 4) kids together with a lesson on shapes. Illustrations by Katherine Janus Khan reminded me a lot of Eric Carle’s style. Four Special Questions by Johnny Zucker is also targeted to preschoolers and appropriate both for Jewish families and for children of different faiths. Despite its name, the book only mentions the ritual of four questions of Passover but doesn’t provide them. It focuses instead on special foods of Seder plate. 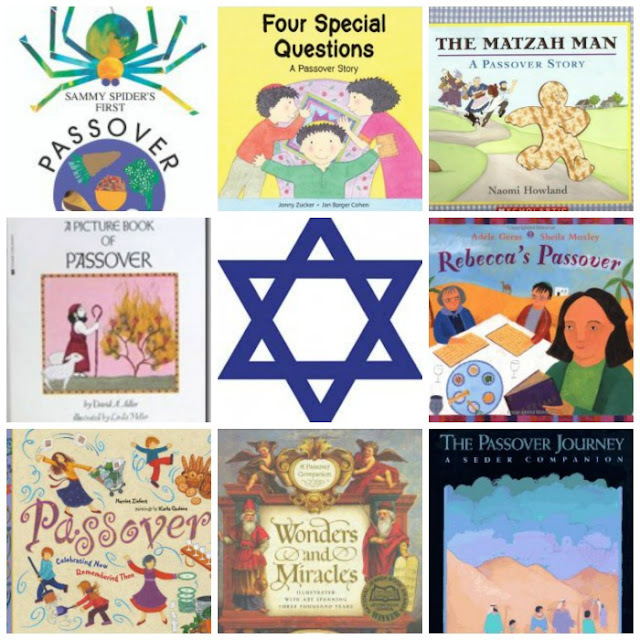 Passover: Celebrating Now, Remembering Then by Harriet Ziefert will appeal both to younger and to older kids because of terrific illustrations by Karla Gudeon. The book doesn’t have a lot of text allowing the parents or child’s imagination to expand on beautiful pictures. I love how every double spread pairs modern part of Passover ritual with the portion of Exodus story that it is supposed to represent. A Picture Book of Passover by David Adler is more suitable for children 5+ (US kindergarten and older). This story is fairly detailed and retells the Biblical story including the plagues. It ends with the description of Passover Seder and explanation of major Passover symbols. As you can imagine, The Matzah Man by Naomi Howland is a Passover version of The Gingerbread Man even though I am yet to see anyone making a man out of a fragile matzah dough. This book has little to do with actual holiday, but will provide a great “compare and contrast” lesson for ages 5+ when read next to the original Gingerbread story. Rebecca’s Passover by Adele Geras illustrated by Sheila Moxley is Smarty’s favorite Passover book. A narrator is a modern 8 year old girl, and she explains how her family prepares for Seder. Smarty loves the additional excitement in the middle of the book when an unexpected visitor arrives to share Rebecca’s family celebration. We read this book for the first time when Smarty was in preschool, but I’d say that it’s targeted to children 7+, because it’s rather long. I also shared Elijah Cup - a fun art project to go with this book. Wonders and Miracles: A Passover Companion is certainly a book for older children (I agree with Amazon recommendation of grade 3-7). The book walks a reader through all components of Seder through short stories, poems, art and explanations. This thick book was a little too involved for my 7 year old to read cover-to-cover, but she enjoyed many stories from it. The Passover Journey by Barbara Diamond Godlin is a good “in-depth” book for older kids, especially if they are invited to Passover celebrations in more traditional households of their friends. This book starts with a detailed retelling of Exodus story, and then describes in detail every step of traditional Seder meal and a reason behind it. It proved to be too detailed for my 7 year old daughter at this stage, but I think she might enjoy it when she is older. Do your children know the story of Passover? More Book Lists for Kids? Follow my Best Children Books Booklists Pinterest board! Well, I've got 2 new books to add to my wishlist. FYI the Elijah glass post link isn't clickable. What a great range of books! Thank you for sharing these.